today we're teaming up with reputation management to talk about googling yourself. when you look yourself up on google, some results can be amusing, but others can be scary or even detrimental. if you are an individual interviewing for a new job or a business hoping to attract new customers, your online reputation is under the microscope. 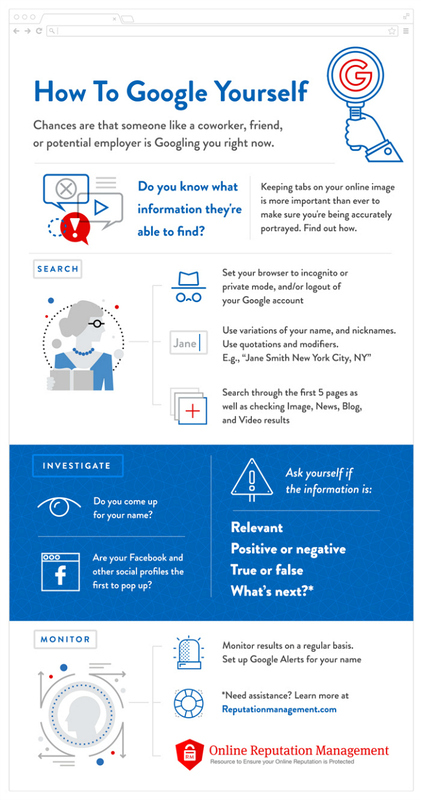 it's important to take a proactive approach to how we're perceived online, so the folks at reputation management have developed an infographic with tips and advice . . .
so what happens if you google yourself and you do find information that isn't even close to reality? luckily, reputation management has put together a few things that you can do to fight false reputation claims online. let's all be kind to each other online! That is a good public service announcement. I wish more people thought about their reputation and others' reputation before they post thing. Good idea and clever infograph.